We've all received weird "shipping-delayed" notifications. Usually they're something inane like "address does not exist" even though you're standing right there. The one I got just now from UPS, however, is rather special. I'm sorry, did you say train derailment!? We're reaching out to UPS for a comment. 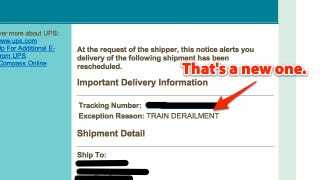 In the meantime, anybody else's package go missing due to a mysterious locomotive disaster? UPDATE: Turns out it was the BNSF freight train and it happened in Wolf Point, MT. The derailed cars, the equivalent of about two-dozen regular-sized cars, derailed in accordion fashion with some piling on top of others and some ending up on their sides. Some cars were ripped open and spilled freight, including designer handbags, shoes, batteries and canoes.